Hello Tampa Bay, Alex back to let you know about a great event happening at Tampa’s Lowry Park Zoo. The 25th Annual Zoofari is taking place at Lowry Park Zoo on November 5th from 7-11p.m. This event will be a night full of food, drinks, music and fun! You will be able to enjoy food from over 50 local restaurants, an open bar and a live performance by Rock & Roll Hall of Fame inductee, Dave Mason. This is a big event that you won’t want to miss! Click here, to check out some of the participating restaurants. Tickets are $75 online- through Nov. 3rd at 5p.m., $80 over the phone- through Nov. 3rd at 5p.m. and & $90 the day of the event. So, hurry up and get your tickets today at, http://www.lowryparkzoo.com/zoofari/index.html. 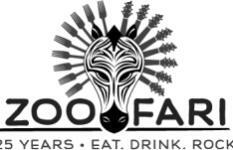 Tell your friends and family about all of the fun that will be taking place Zoofari on Nov. 5th.